It’s been a very short story few days. On Tuesday I showed off a couple of new covers for upcoming books with new stories from me in them. On Friday, I looked at whether short stories had a place in my upcoming year of freelance writing (they do). Yesterday, I read you the opening of one of those new stories through the medium of my actual face. Today, I’m getting The 52 up and running. Starting on January I’ll be publishing a new short story here every week. I don’t know what they’re called, or even what they’re about, because I haven’t written them yet. I need your help for that. Earlier this year I asked people to recommend me their favourite book. The response was fantastic, as I hoped. People like to share the things they love. I’m working my way through the selection now, and having a great time doing so. Not all have turned out to be my favourite book, but each is taking me somewhere I never would have gone if left to my own devices. I want to do that with writing too. I want to get to places I can’t on my own. That’s where you come in. I want you to send me images. Things you photographed. Things you painted. Things you drew. Things you made. Scenes, landscapes, items, moments, shapes and shadows. Beautiful, sad, funny, weird, sinister, quirky. I don’t care what it is or how much immediate sense it makes. I just has to be an image that you somehow captured or made, and that you think looks neat. Each one of the images will be the starting point for a story. Because the story will come from an image I’m not responsible for, it will be a thing that could not have happened if it were just me typing on my own. You and I will have made something brand new. If you don’t have an image you want to send, go and make one. If all works out, I’ll publish a story a week here on this blog, and at the same time possibly via a second service (I’m looking at Wattpad) where readers can get it for free. Your image will accompany the story, and you’ll be credited however you like. Well, whatever. Do cool things with a story you helped make. Or do nothing, and just be pleased it exists. It will only exist because you do, which is one of the most exciting things about making art. Why? Because I like the idea. Because it’s absurd, and ambitious, and might be fun. Because planning out how I’m going to try to turn my writing hobby into a living has reminded me that it’s good to do things just for the hell of it too. Because I like connections and chaos. 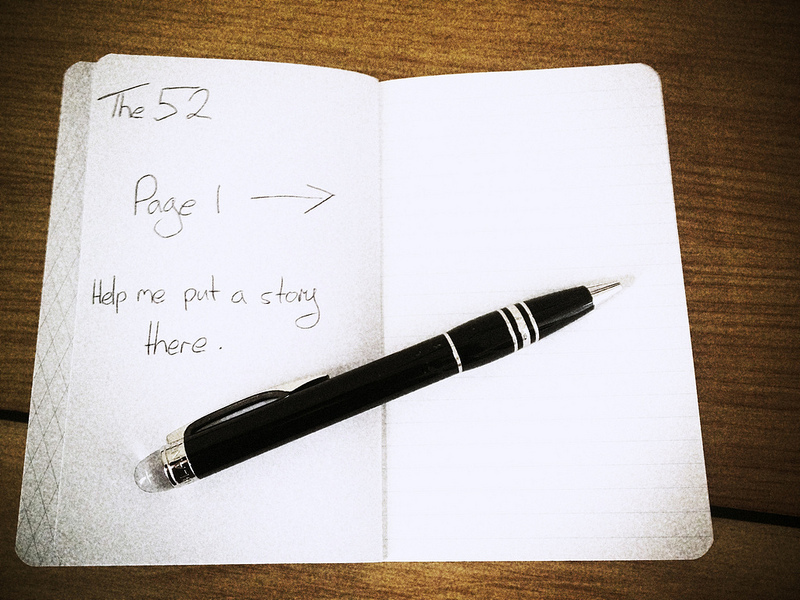 What happens if it goes wrong, and you can’t write 52 stories in a year? I’m sorry to be the one to tell you this, but if that happens then the world will end. Immediately and without warning. What happens if you don’t get 52 images? I’ll either abort the project, or change the title. One or t’other. What happens if you get more than 52 images? I’ll either write more stories, or be spoiled for choice. If I send something, will you definitely use it? No. If I get a lot, I might not be able to. That will make me sad. Me too. Will these be horror stories? I don’t know. Not necessarily, and that’s not the aim. They’ll be whatever they decide to be. It’s fair to say though that I’m unlikely to decide to write 52 stories about kittens and fluffiness. You never know though. Have you got plans for these stories in the future? Not really. If they’re good, I might see about publishing them as one or more collections, or having somebody else publish them. The images will never be reused without the permission of the person who owns them though. Why are you telling us about this now – it’s ages until December! To give people time to submit something. To see if anybody wants to play at all. If it becomes clear early that I’ll have enough to go ahead, then I’ll probably start writing towards the end of this year. What if I send something and don’t like the story you make? That will make me sad. Some other points, to be clear. Once posted, both the story and the image will stay on my website and Wattpad (if I go that route) indefinitely. I will never charge people to enjoy them there. You own your image, and can continue to do whatever you like with it even after it appears here. You’re giving me licence to post it in the places described above for an indefinite period. If I ever want to use it again, I’ll be in touch – and you can say no. I’ll always keep you personally in the loop about what’s happening to the story you inspired, even if I’m not re-using your image. When your story is published on this site, I’ll email you so you don’t miss it. I own the story, and can do what I like with it after it’s published. As I said above, you can do what you like with it too – up to a point. There will be some loose conditions. You’ll need to credit me as the writer. You won’t be allowed to change the story or the words in it without asking me first (because, for good or bad, my reputation as a writer is about the words). Whatever you do, I’d like you to keep me informed too. Finding out what can happen to stuff when I step back is part of the fun. The only story you can do cool things with is the one your image inspires. At the top of this page there’s a ‘Contact Richard’ link. If you’ve got any questions or concerns at all about any of this, drop me a line. You can also post in the comments below, and I’ll reply. So, will you help? Will you make a story with me? Please send stuff to storywright [at] gmail [dot] com. In the subject field of the email put ‘The 52’. In the email itself I’ll need your name, and if you have a website you want me to link back to if and when the story appears then let me know (but you know, feel free to introduce yourself if we don’t know each other!). By sending me an image, you’re promising me that it’s yours. And please share this post. I really want The 52 to happen, but it’s a true collaboration. I can’t do this one on my own. I need you.There are magic sharing buttons at the bottom of this page, but anything you can do to tell people who might want to play (even if you don’t) will be deeply appreciated. Apparently, people who need people are the luckiest people in the world. I need people, so let’s see if that’s true. *Actually, don’t do that. Or anything else that involves me being abducted against my will, tied down, and repeatedly stabbed.